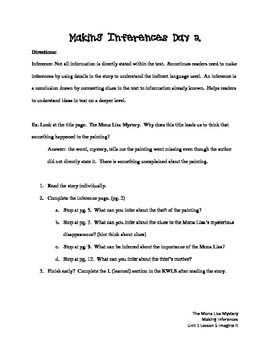 This lesson is intended for students to use the story, The Mona Lisa Mystery, from the Reading A to Z website. 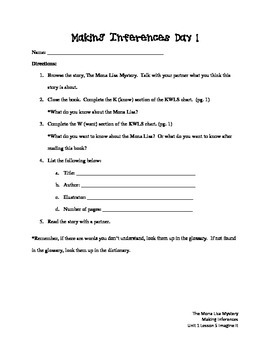 The Mona Lisa Mystery is level P. You will need a username and password in order to access the book and the extra sheets to include with the packet. Behind each page is one of the worksheets provided by Reading A to Z. I am unable to attached the worksheets to this packet due to copyright. Answer keys of the added worksheets can be found on the Reading A to Z book site. I use this book in Small Groups with my high level students in 2nd grade to help increase their MAP scores.